ICAD is the premier forum for presenting research on the use of sound to provide enhanced user interfaces, display data, monitor systems, and for computers and virtual reality systems. It is unique in its singular focus on audio and the array of perception, technology, design and application areas that it currently encompasses. Like its predecessors, ICAD 2001 was a single-track conference. Attendance was open to all, with no membership or affiliation requirements. 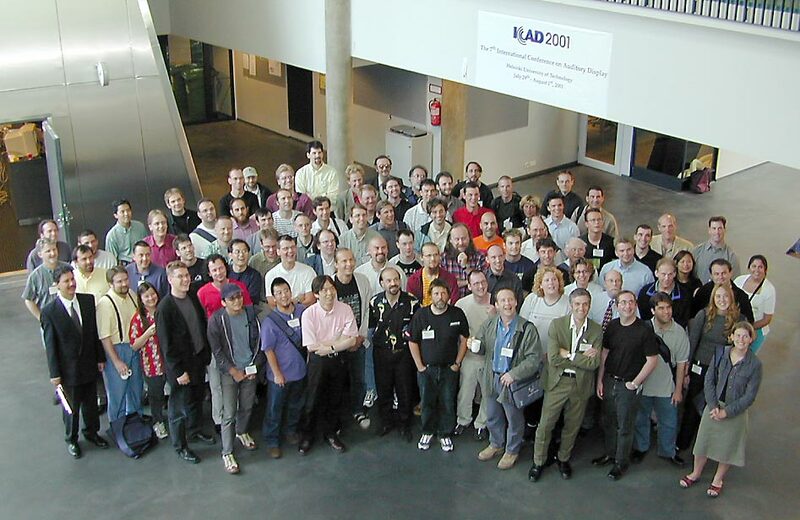 ICAD 2001 has been held on 29th of July-1st of August 2001 at Helsinki University of Technology. This leading technical university in Finland is located in the city of Espoo, 10 kilometres west of downtown Helsinki (Capital of Finland). December 30, 2002. Mail address icad2001@acoustics.hut.fi no longer active. August 10, 2001. The proceedings added to these pages. August 8. The "audiograph" of ICAD2001 in wav and mp3 -format. Also a photograph of ICAD2001 participant, just 2 seconds before making "audiograph", is here. July 23. Program of the conference updated. June 21. Guidelines for oral presentations and posters can now be found in presentations page. June 1. The preliminary program of the conference has been updated, see program page. March 21. The registration information can now be found in registration page. The preliminary program of the conference is in program page. A trip to Nuuksio has been added to social program, see Conference page. March 12. The list of accepted papers has been added to Conference page. February 12. Information of social programme has been added to Conference page. Detailed information of hotels and hostels can be found at accommodation page. General information of Finland and the conference has been added, and our conctact addresses are here. November 21. The template files are now available on the Templates page. Please keep in mind that the deadline for submissions is January 19, 2001! You may send your submission to icad2001-submissions@acoustics.hut.fi in the Postscript (.ps) or Adobe Acrobat PDF (.pdf) format. June 21. The Call for Papers is available.